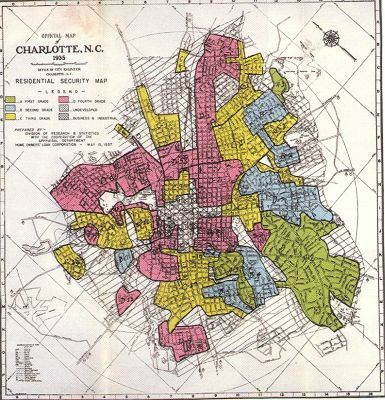 Redlining refers to a discriminatory pattern of disinvestment and obstructive lending practices that act as an impediment to home ownership among African Americans and other people of color. Banks used the concept to deny loans to homeowners and would-be homeowners who lived in these neighborhoods. This in turn resulted in neighborhood economic decline and the withholding of services or their provision at an exceptionally high cost. The origin of the term stems from the policies developed by the Home Owners Loan Corporation (HOLC) created in 1933 by the Franklin Roosevelt Administration to reduce home foreclosures during the Depression and then institutionalized by the 1937 U.S. Housing Act which established the Federal Housing Association (FHA). Federal housing agencies including the HOLC and the FHA determined whether areas were deemed unfit for investment by banks, insurance companies, savings and loan associations, and other financial services companies. The areas were physically demarcated with red shading on a map. In contrast, zones which were to receive preferential lending status were marked in green shading and intermediate areas in blue shading. Often these decisions were arbitrarily based on the area’s racial composition rather than income levels. While the practice was almost universal before 1968, the Civil Rights Act passed that year theoretically outlawed redlining. Nonetheless its impact was felt long after that date. In a series of Pulitzer Prize winning articles which appeared in 1988 under the title “The Color of Money,” Atlanta Journal-Constitution reporter Bill Dedmen described how Atlanta, Georgia banks still discriminated by the racial designation of neighborhoods. His article illustrated how these banks were nearly twice as likely to lend to homeowners and prospective home buyers in low-income white neighborhoods as in affluent black areas. As a consequence of redlining, neighborhoods that local banks deemed unfit for investment were left underdeveloped or in disrepair. Attempts to improve these neighborhoods with even relatively small-scale business ventures were commonly obstructed by financial institutions that continued to label the underwriting as too risky or simply rejected them outright. When existing businesses collapsed, new ones were not allowed to replace them, often leaving entire blocks empty and crumbling. Consequently African Americans in those neighborhoods were frequently limited in their access to banking, healthcare, retail merchandise, and even groceries. One notable exception to this was (and still is) the proliferation of liquor stores and bars which seemingly transcended the area’s stigma of financial risk. Redlining also led to an appreciable dearth of employment opportunities in these neighborhoods as prospective small scale employers were disinclined to locate there. Crime often followed in the wake of these declining neighborhoods making future investment less likely. These developments created a cycle which seemingly justified the initial redlining practices. Bill Dedmen, “The Color of Money,” The Atlanta Journal-Constitution, May 1, 1988; Jack M. Guttentag and Susan M. Wachter, Redlining and Public Policy (New York: New York University, 1980); Kenneth T. Jackson, Crabgrass Frontier: The Suburbanization of the United States (New York: Oxford University Press, 1985); Gregory D. Squires, ed., Insurance Redlining: Disinvestment, Reinvestment, and the Evolving Role of Financial Institutions (Washington, D.C.: Urban Institute Press 1997).